After you’ve ruled out interference, your users may still be experiencing issues. Creating a packet capture with Eye P.A. + AirPcap Nx (or b.y.o. 3rd party capture file) allows you to see a picture of how your channel is being used, packet-by-packet. With just a glance you can get an idea for the total utilization of air time, packets sent, and bytes present in your capture– the bigger the slice, the more activity taking place. From here, it’s easy to drill down to exactly what you’re looking for. 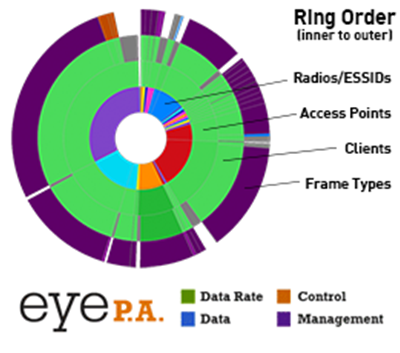 In addition to supporting a variety of packet capture formats, Eye P.A. also supports packet capture with the AirPcap Nx. This 2×2 MIMO device allows you to record 802.11a/b/g/n packet captures in both the 2.4 GHz and 5 GHz bands, without launching another program.